Where Do the Calories in Vodka Come From? Vodka is a hard liquor known for its high alcohol content. Usually served in mixed drinks or as a 1-oz. shot, vodka is a main staple of many business who specialize in service of alcohol. One oz. of vodka contains 65 calories per serving, according to College Drinking Prevention. 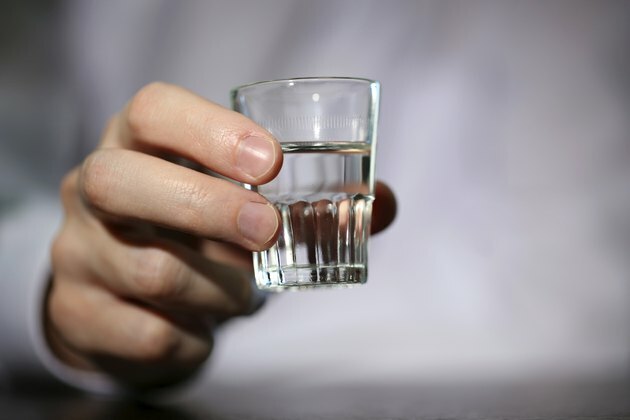 A serving size of vodka is 1 oz., the same size of a standard shot glass. Vodka is also composed of 40 percent alcohol, a significantly higher alcohol content than beer and wine. Alcohol is formed during the fermentation process of sugar and starches, such as yeast according to MedLinePlus. Because vodka contains a higher alcohol content than wines and beer, its calorie content is higher. Starches and sugars provide your body with empty calories that are used as energy before stored fat. Alcohol contains seven calories per g, according to ShapeFit.com, with liquors containing 40 percent alcohol, beer containing 4 percent to 8 percent alcohol and wines averaging 12 percent to 14 percent alcohol content. No matter the alcohol content, excessive drinking is dangerous and can damage your stomach, kidneys and liver. Drink responsibly for your health and the safety of you and others.